Wow… Wow… Wow… Wow… And Wow…..
Like… people… this place definitely has to be one of the most beautiful places on Earth. 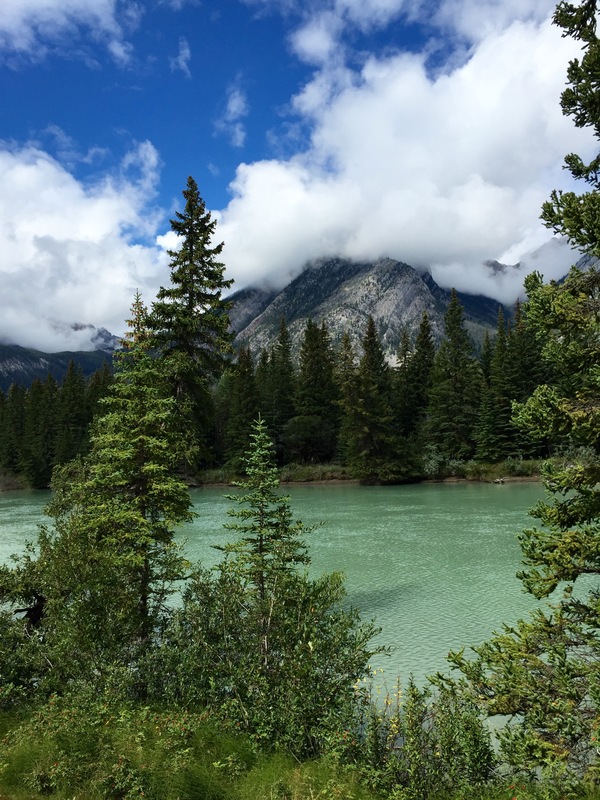 Banff National Park is simply stunning! Eye-candy. Glacier National Park times 100. The Picasso of landscapes. God’s Altar. You name it. It was just the epitome of a flawless creation made to please the eyes. Here’s a quick little blooper that I made on my drive up to Canada. I was contacting various friends and family about an hour or two into my drive. I was texting my dad and faux-mama. 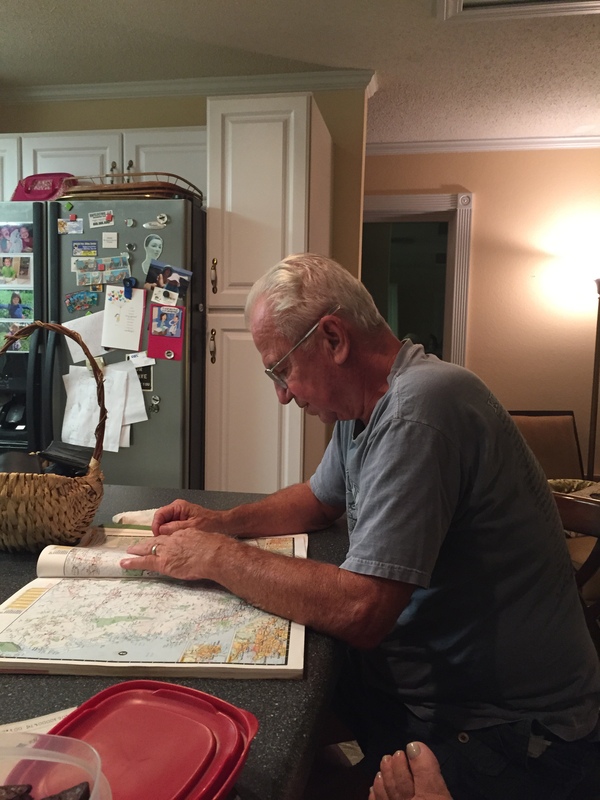 I was commenting on how beautiful it was, sending photos and such, and, well, dad wanted to chart where I was. He loves a map, you see. (proof below) My stepmama was looking for me online on Google maps. Anyhoo, I chimed in that I was coming up to, or had just passed ‘x’. Well, they were charting me, and I decided that I wanted to chart me as well, so I opened Google maps. To my shock, the moving dot on the screen had me going south. (South?!) Wait….that aint right. So, I looked at a different online current-time map to see if it had me going south. Still, I was going south! (This story does not bode well for me and my directional capabilities regarding another story you will read in another couple of paragraphs….rrrrrrgh!) So, thanks to dad and faux-ma, I realized I had missed a turn and was headed to Idaho! Little blue dot heading SOUTH!! 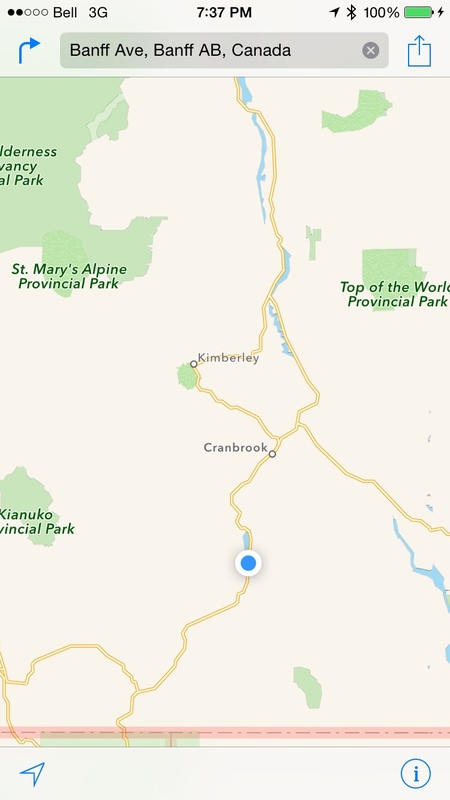 I should have taken a right up there somewhere, north of Cranbrook! DAAAAAG NABBIT! 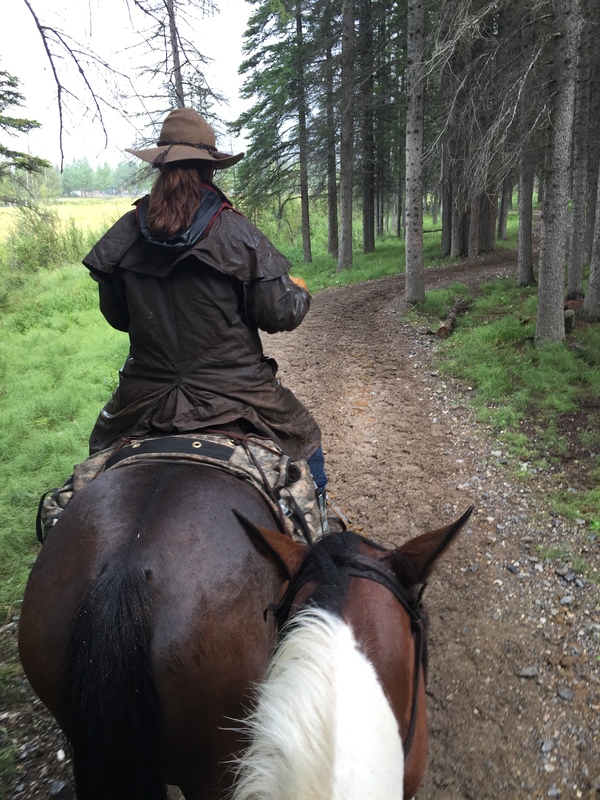 So are the my adventures… So I ended up with about 40 minutes out of the way. (rrrrrrrrr) Happily, The Girls didn’t seem too bothered by the detour. On to Canada! But, oops, I forgot to research a few things about the country…. Had to park this little puppy at the border until I got back! 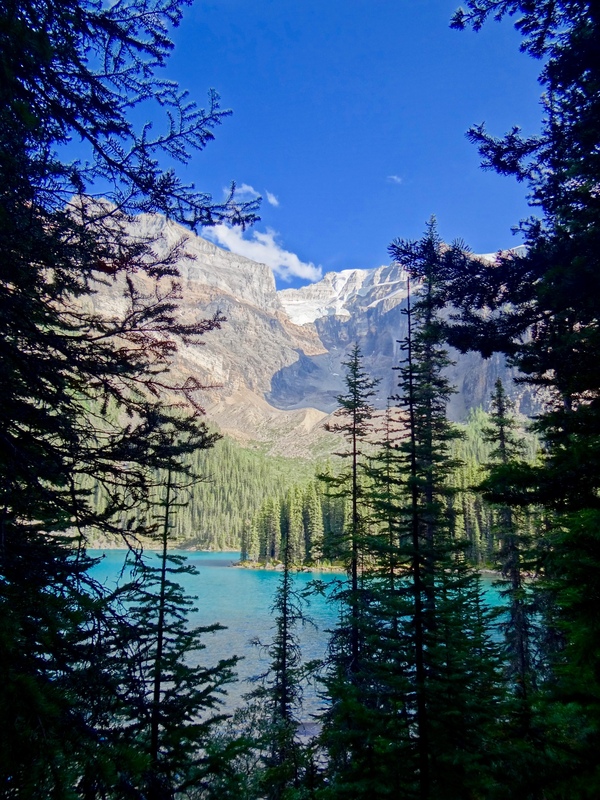 I drove into Banff at night, after it was just too dark to see much, yet I COULD still see the silhouette of the gigantuous mountains which were surrounding me. It was a cruel tease… I knew they were there, but I could only make out the silhouette of their size and beauty. 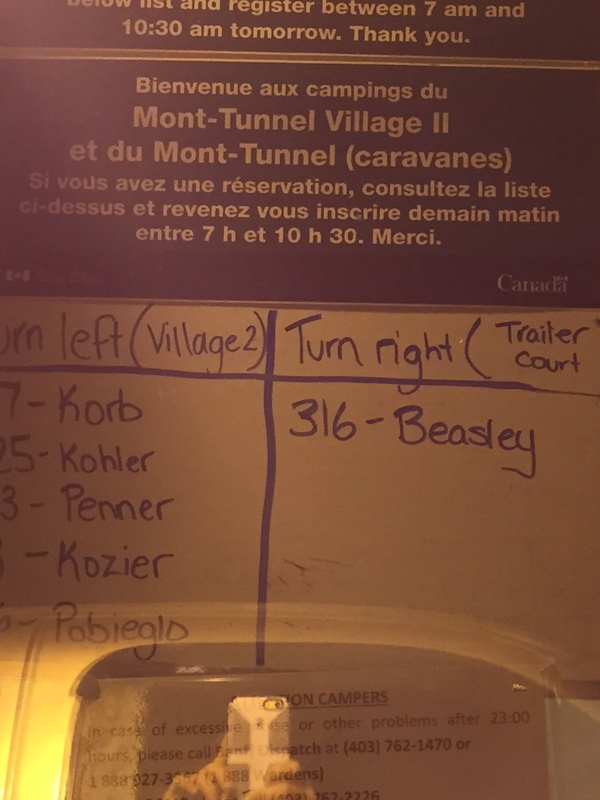 Around midnight, I found my campground. 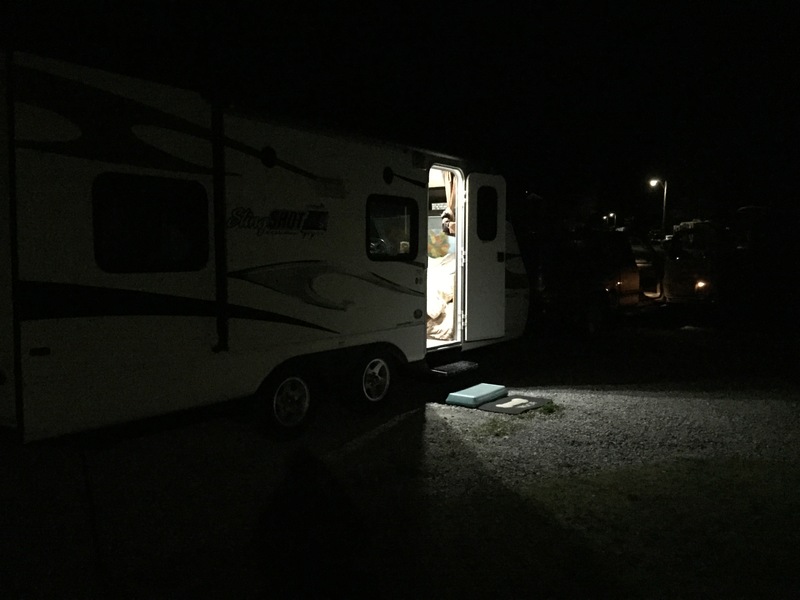 Below was an unexpected welcome from the campground… nice touch! After hooking up my power, we hit the sack for the night. Did just enough done to have heat. Then, lights out! The next morning, I took the girls out but I did not yet realize what was surrounding me. To my complete shock, as I rounded the corner to go up (down?) the north-south road, I found myself face to face with one of the most gorgeous, tallest mountain faces I have ever seen in my life. “My” mountain. The photo does this thing NO justice. I was really struck by it, as it was just so MAJESTIC ( I know, that’s an overused word, but it really applies here) and powerful. Wow. This is the view from my campground?? Come to find out, this is the view almost anywhere you go in the park! So- I was in heaven. 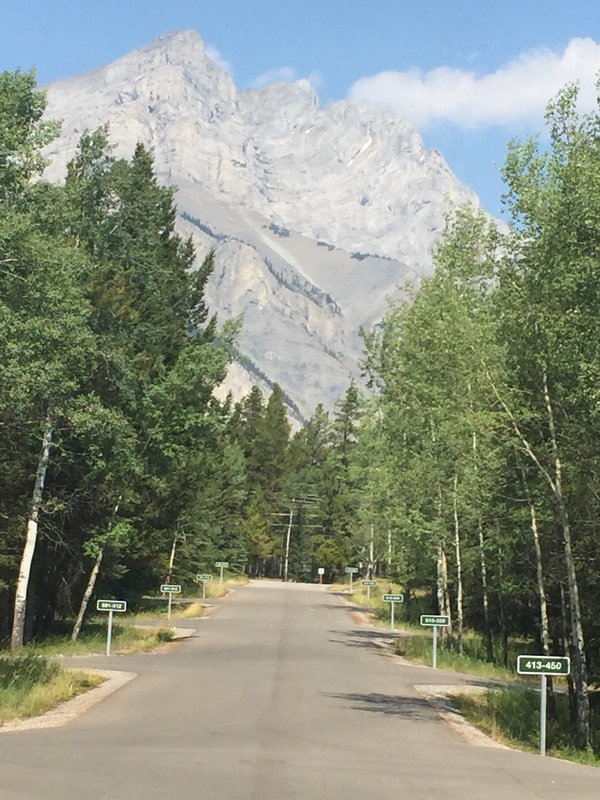 The campground where the girls and I stayed was just outside of downtown Banff and it was called the Tunnel Mountain Village and Trailer Court. It was a simple grid like layout of north and south, east and west roads. Or, horizontal and vertical lines on a map. Easy peasy to get around, right? For whatever polaric disconnect that happened to me, I could NOT get my bearings at this place! Each time I walked out of my RV, I thought I would know which direction to look for ‘my mountain’, once I got to the north south road. It was as if I was in a geographical area in which my internal compass had been shut down. Usually, I have pretty good bearings in this regard, but I would put money on the fact that there was some polar interruption here that made my directional abilities go numb. I stayed for an entire 7 days, and STILL did not have my bearings, even on the last day. Whatever. On about day 4 at the campground, suddenly my little Slingshot RV was surrounded by the supermodels of the Rv world- Airstreams! Like a big tease, they surrounded us, and it made every other Rv seem like the ‘trash pit’ of the street. 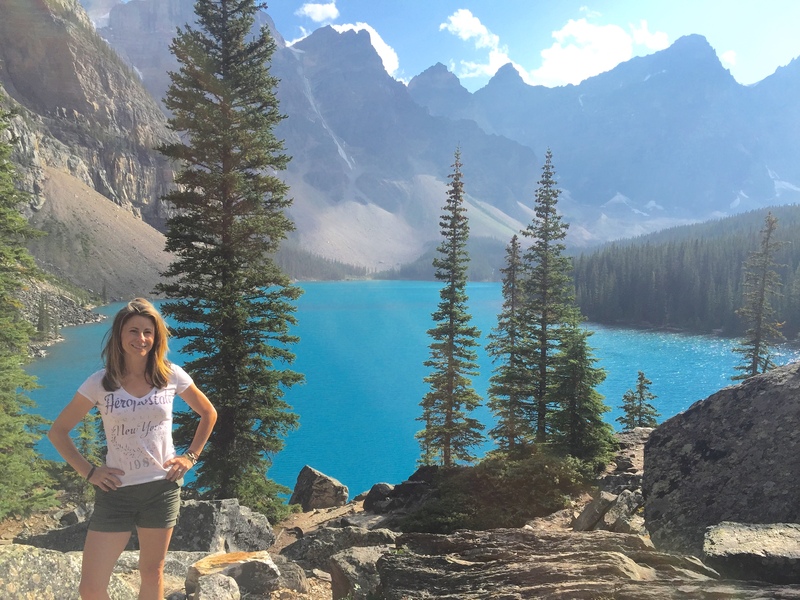 The one spot I kept hearing of, aptly named “one of the most beautiful places on earth” was Moraine Lake. 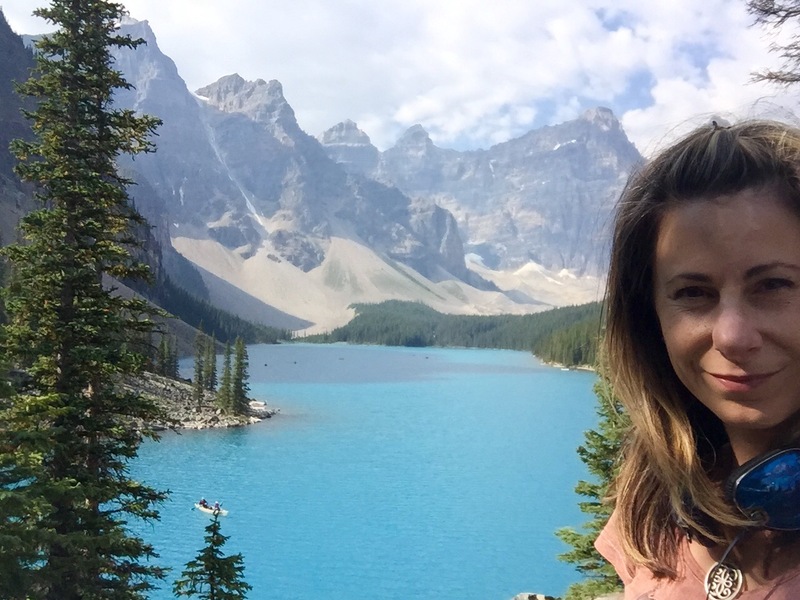 Super Selfie at the great Moraine Lake! 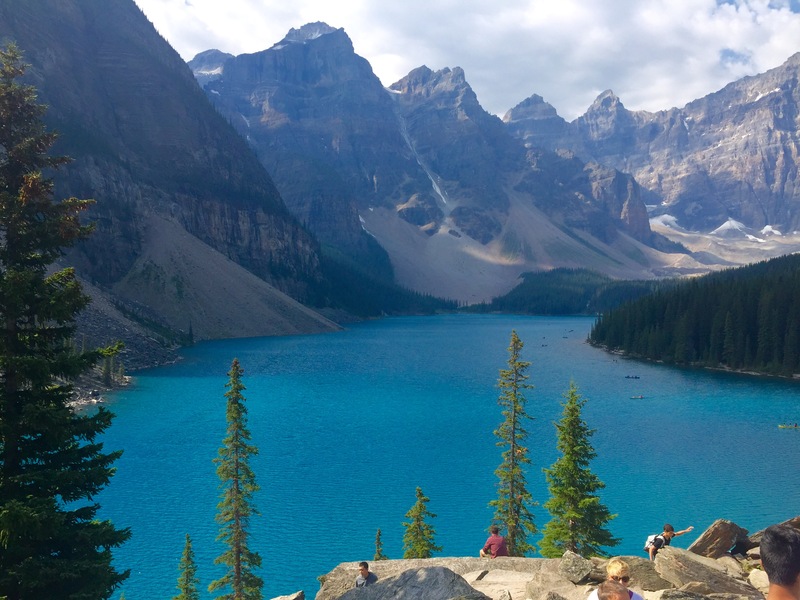 Moraine Lake was the crowning glory of the park and it was the sole reason I decided to visit Banff. My photos are not going to do it justice as I was not there with the best light available. Also, it was such an expansive area, I needed a wider angle lens to really get a good shot. But I did my best, and had some great weather on my first visit to Moraine. Still, the sun was not at the best spot in which it could have been as I got there so late in the day, and the sun was almost in front of my lens. My second visit proved to be fairly cloudy. In fact, the last three days of my stay were cloudy. So goes the mountain weather. Needless to say, I did not get the shots I had wished for. 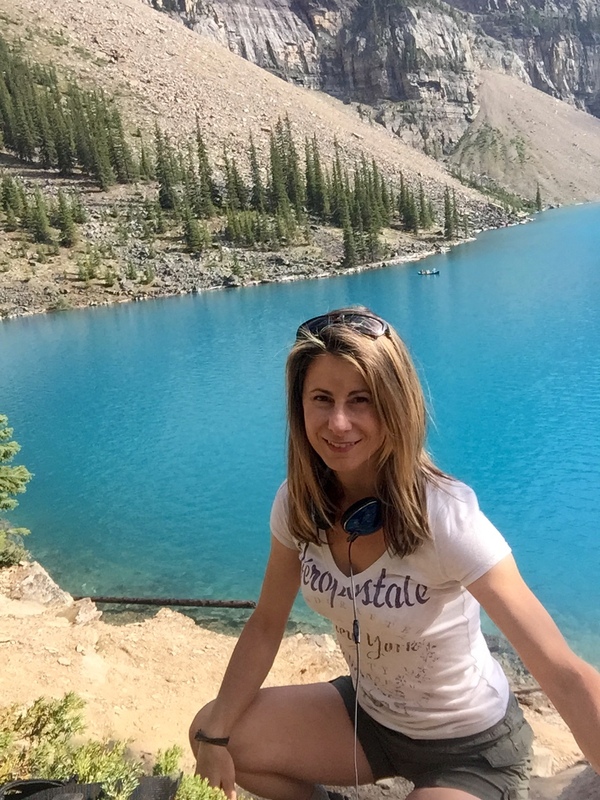 This is likely one of my favorite photos of myself at Moraine Lake. Pardon my self indulgence, but being there was something I had imagined happening for some time, and there I am, right in that special place. I made it happen. I guess it is true, you create your own destiny. Right? 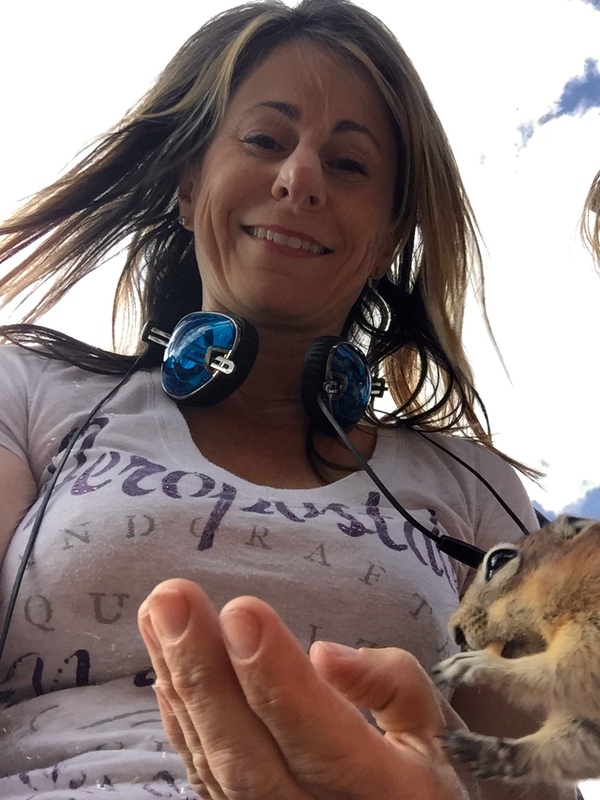 Me and my squirrel! 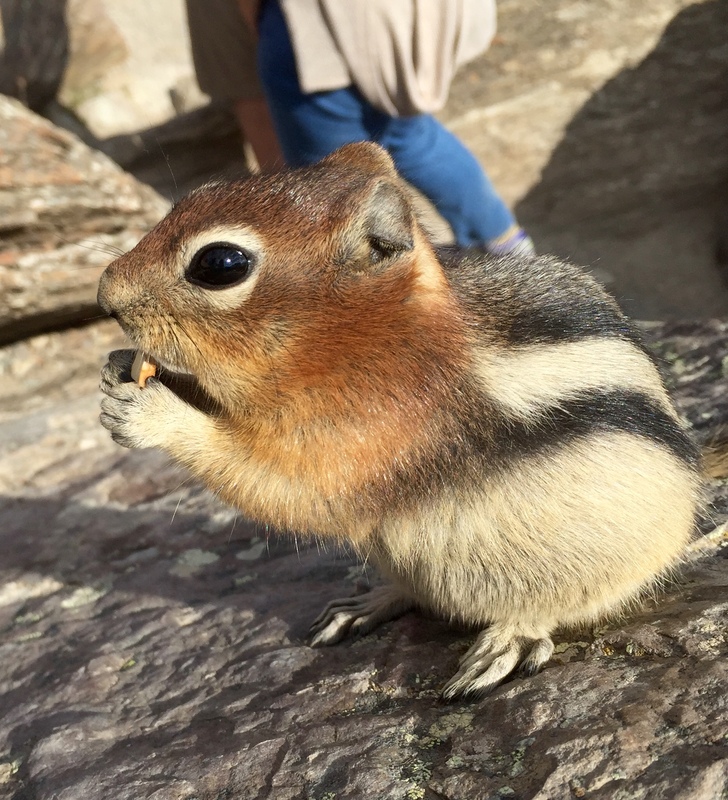 Baby boy eats right out of my hand at Moraine Lake. M’Buddy. He was sweet enough to take a photo with me. But I gave him a peanut. Which, apparently, is against the law, so please don’t report me. 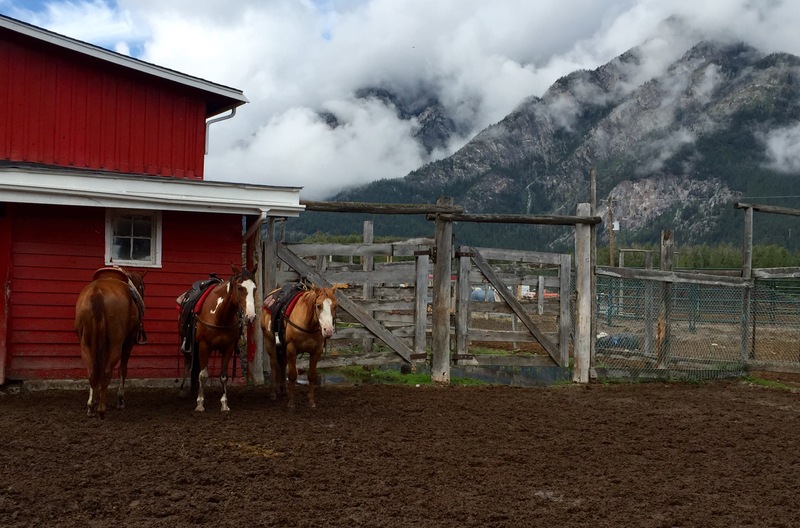 Between Moraine, the Yamnuska Wolfdog Sanctuary and a horseback ride through the woods, plus the brilliantly bright color of the water and the mountains which cradled my heart in Banff, this was a trip of a lifetime! I will return someday, and the sooner the better! 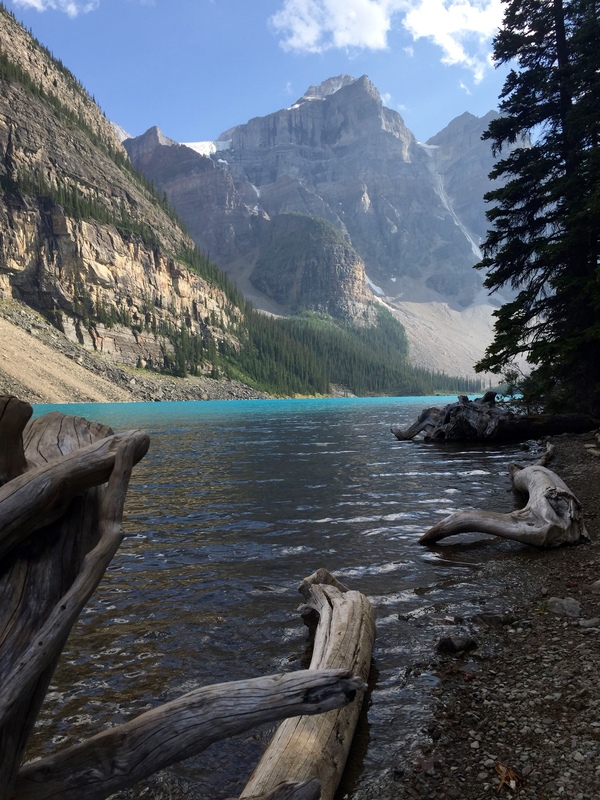 Experience what you will see in Banff from the photos and captions below I took from the trip. 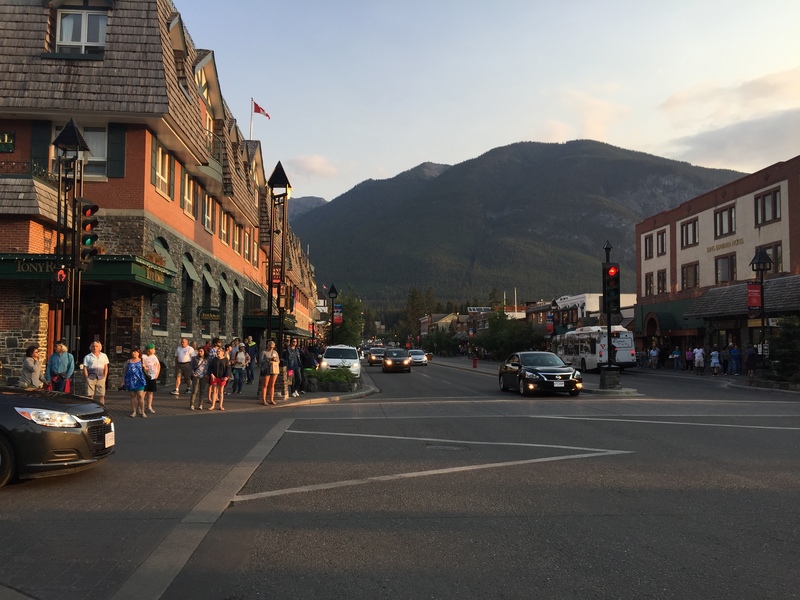 A lil’ example of what downtown Banff looks like. This is the main strip. Shops galore. It was more crowded than this during the daytime. This was taken fairly late as you can see the sun is low, illuminating the building to the left. One of my favorite photos, because It was the first river I saw that had this incredible color. It looked like someone spilled fluorescent dye into the river! 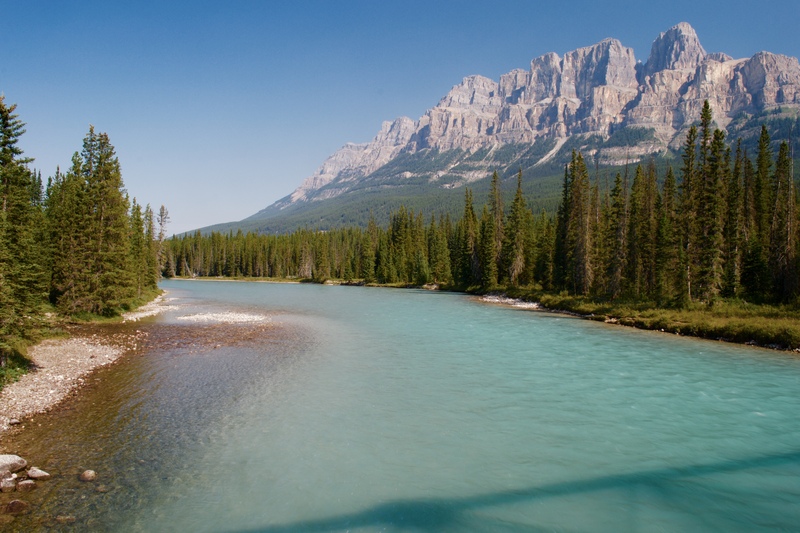 Wowza… Great contrast between the color of the sky and the river, mountain and trees! 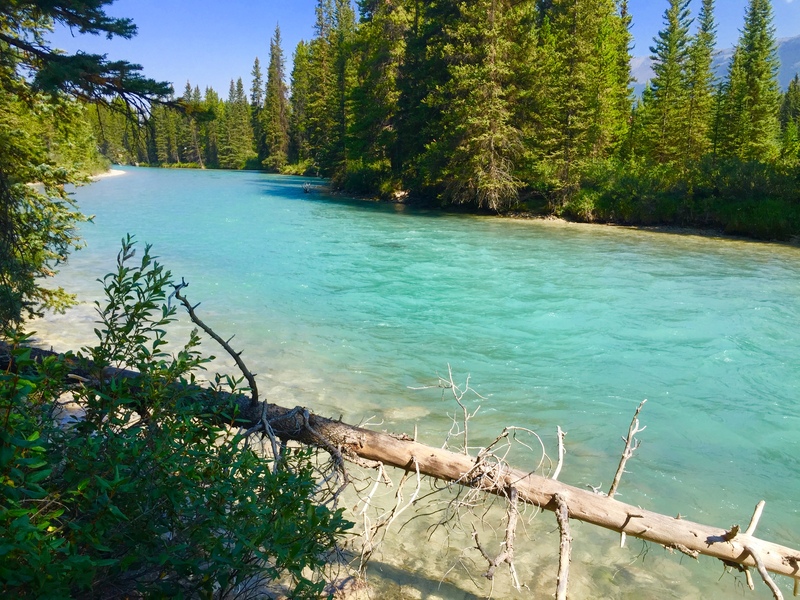 Purrrrrrrrrrrrrrrrrrrrrr… The river is this color due to the minerals that come off of the rocks in a glacier fed river. Horses waiting their turn at the stables. I was lucky enough for it to be just me and the guide on the ride. Because I had experience riding, we went on a more adventurous ride than we would have originally. We had fantastic scenery! 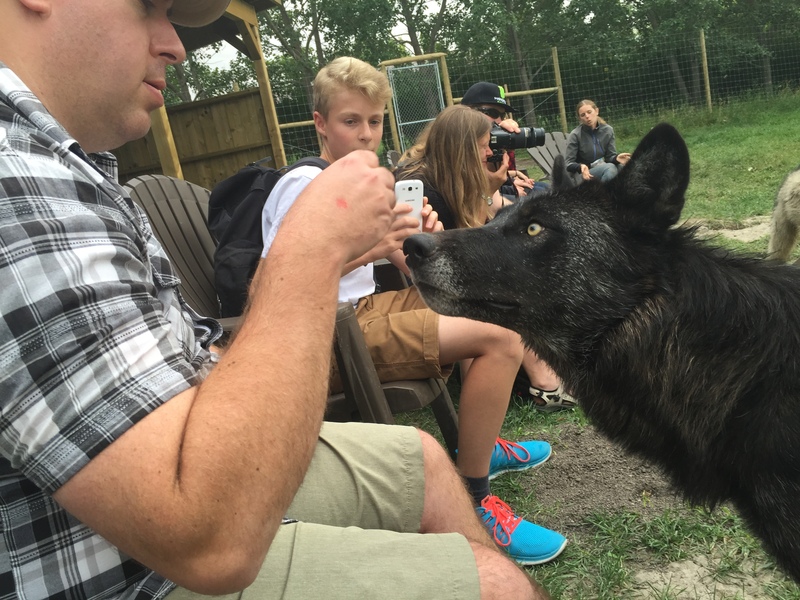 I visited the Yamnuska wolfdog sanctuary just East of Banff. It was a great learning experience about these animals and it was interesting to learn the differences between dogs and wolves. They were so wolflike, it felt like an honor just to be near them! 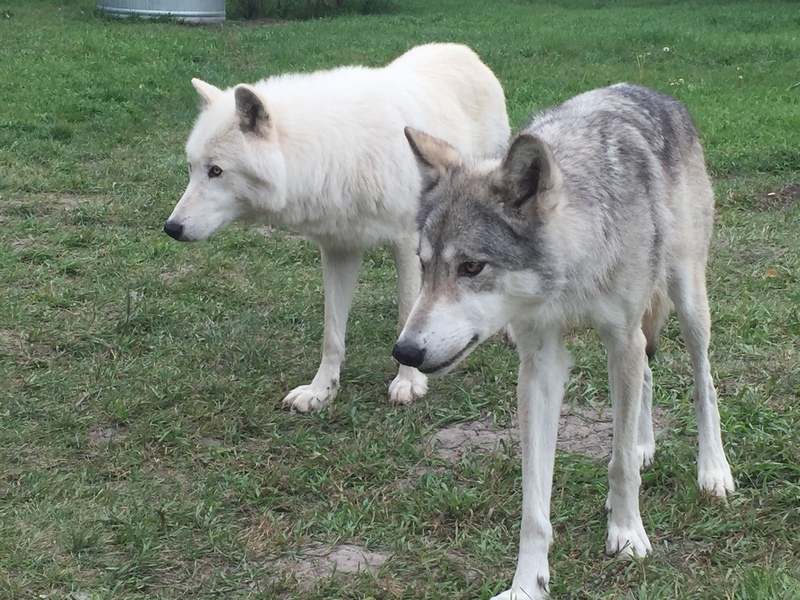 The white one is a cousin of the Game of Thrones wolfdog “Ghost”. 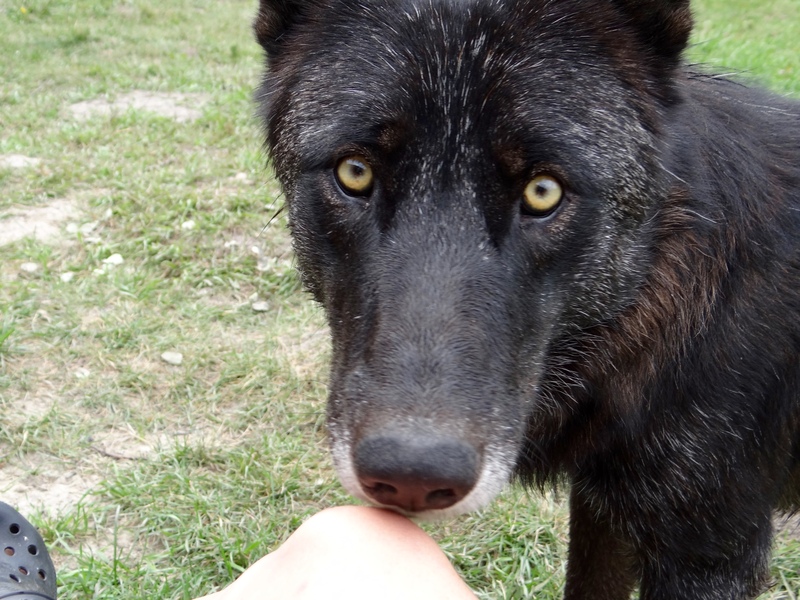 His name is Nova, and he is the ambassador wolfdog at the sanctuary used to help them further their educational programs. The grey wolf is the pack alpha. 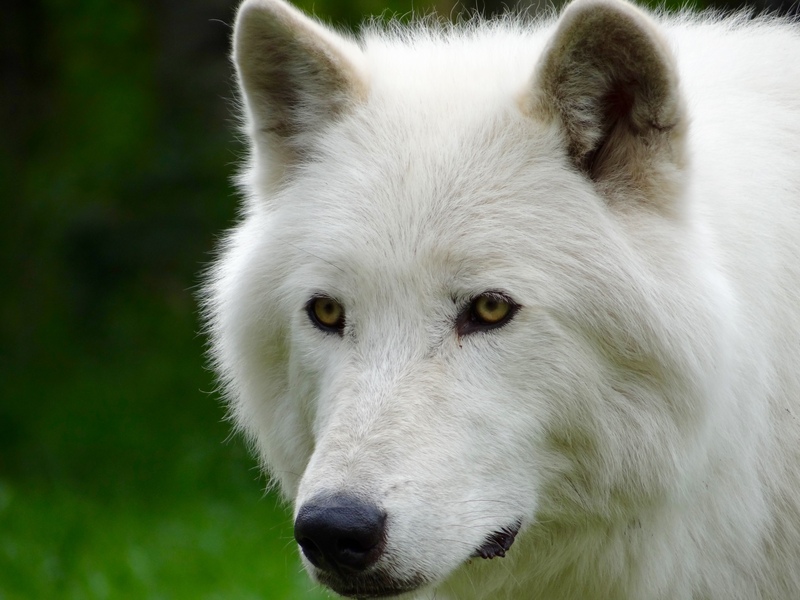 She’s a female wolfdog, and she has more wolf in her than any of the five animals living in this enclosure. Nova is hanging out on her left. As spoken in photos I have seen before, “Yes, it’s that color!” No doctoring here. 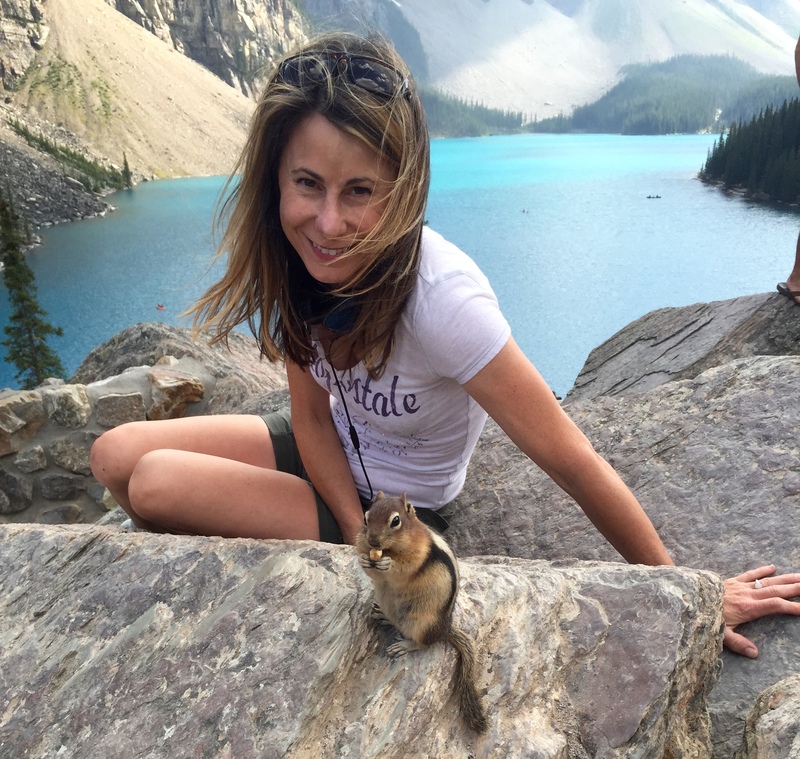 My fearless little buddy squirrel at Moraine. Eats out of people’s hands! Great pics, especially the last one. Gotta get there. Thank you! I hope you do…. It’s a number one on my list, you won’t be disappointed! I’m in Yellowstone now, and to be honest, I’m a it disappointed!!!! 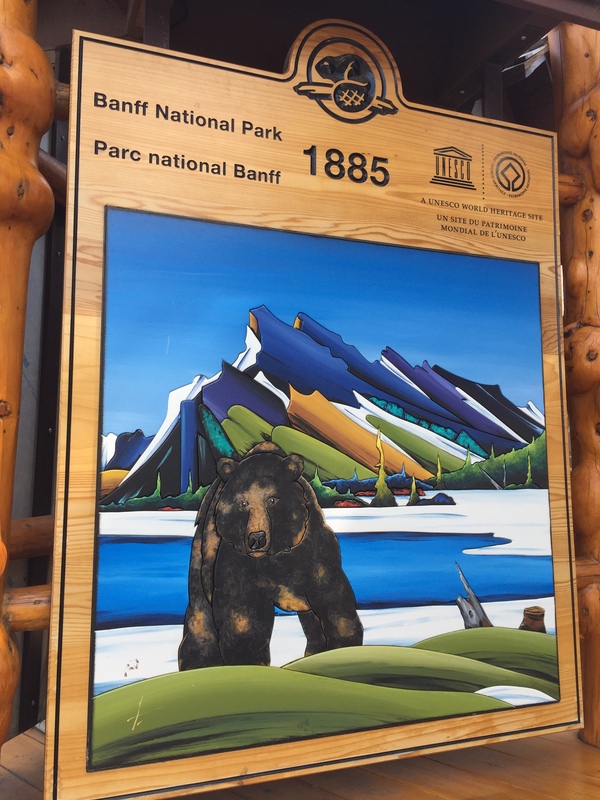 It may be due to the fact I was in Banff very recently. Yellowstone has been anti-climactic as far as scenery goes. Not what I was expecting! Awesome pics. Head south thru the Rockies if you can. Snow is coming. Will be doing so soon! Hey where did you end up, your posts just kinda stopped. 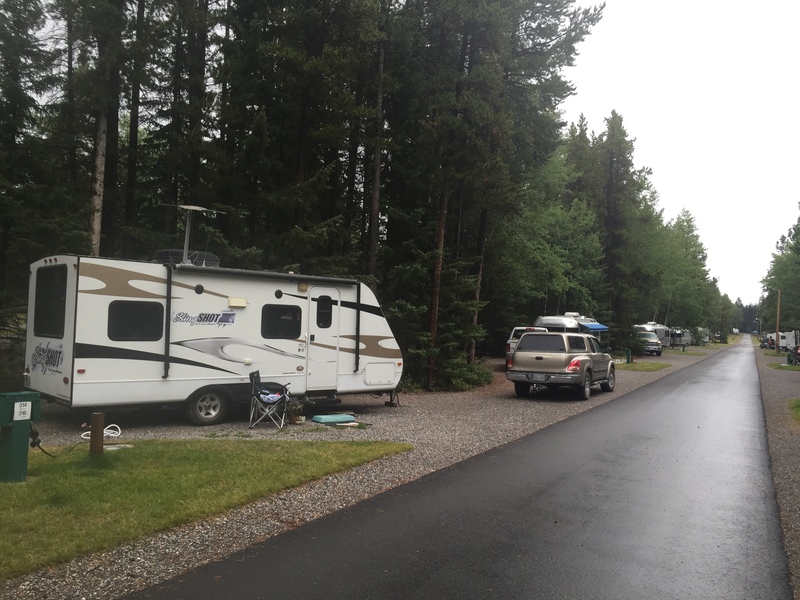 Hi Mitch, I am still up in Montana… Waiting for my mom to pick up her new RV. Thanks for checking in, I have written a couple of articles for the magazine but they haven’t been posted yet. I haven’t written much because I haven’t been doing much. I’m looking forward to getting back on the road as soon as possible (a week?) and I think at that time I’ll have good material to write about! Cheers! Wow, you are getting a touch of cooler weather then, Looking forward to a couple of new posts, hope you enjoyed Canada. Thanks Kelly. I would love to see B N P. I don’t think I ever will. Thanks for letting me tag along. I think you have one of the best blogs on the net. Thank you so much! Wow, that’s really a nice compliment! I am sad to hear you may not ever reach Banff, I will just have to go again to get more ‘footage’ for you to view vicariously! I really like your blog. Thank you for sharing with the world. 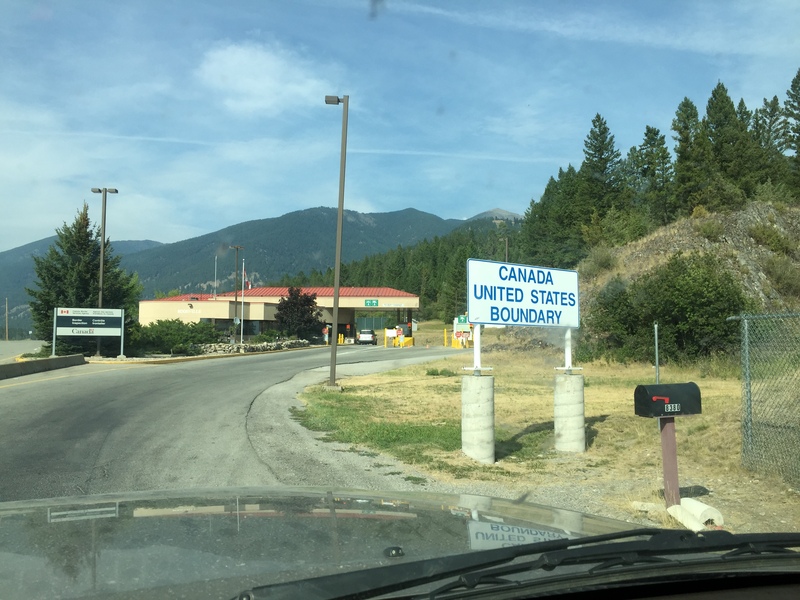 I was wondering if you had any issues crossing into Canada with a trailer and dogs? 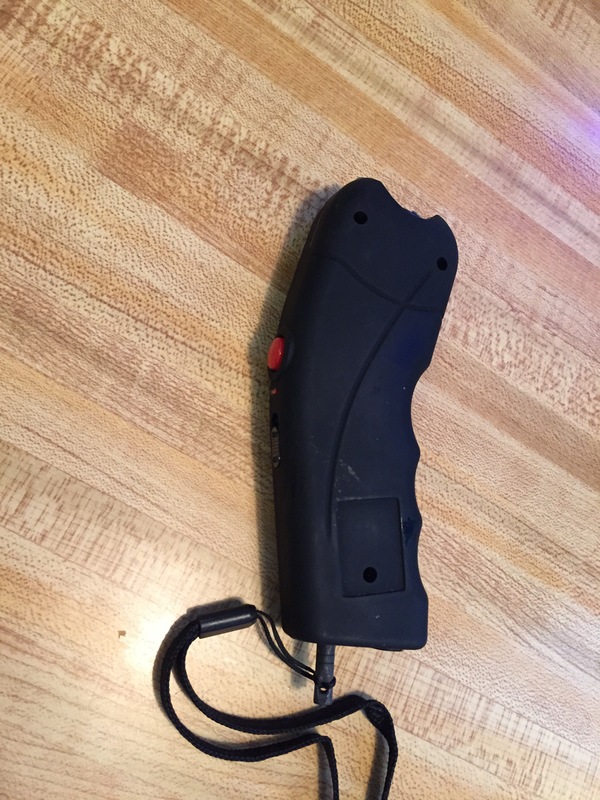 I see that they took your taser (that’s surprising), but I was just wondering if you had any other hiccups or issues?